The Clock Tower, near the entrance to the Prince of Wales Pier, is one of Dover’s landmarks. Originally built in the 1870s during the deepening and reconstruction of what became the Granville Dock. 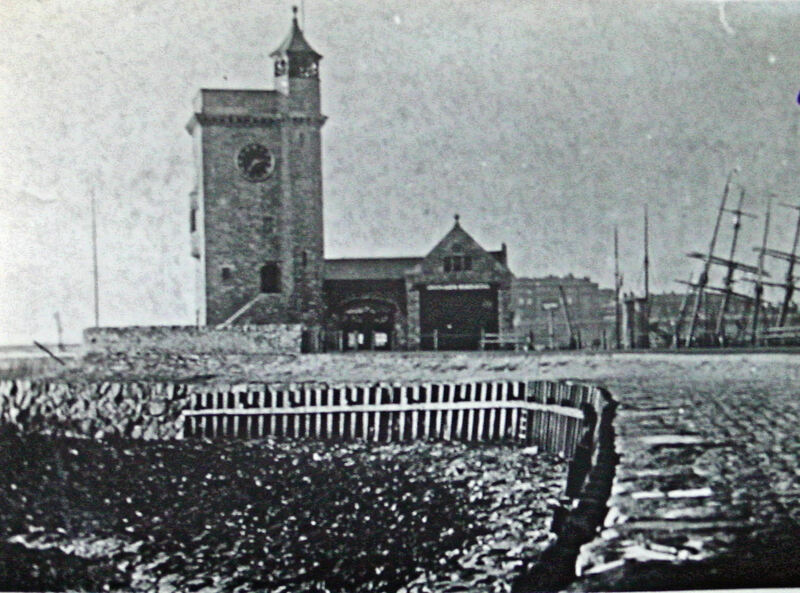 Together with the adjacent lifeboat station the building was demolished and then rebuilt in order to make room for the Prince of Wales Pier in 1891/2. The story of the clocks goes back to the early part of the 19th century. 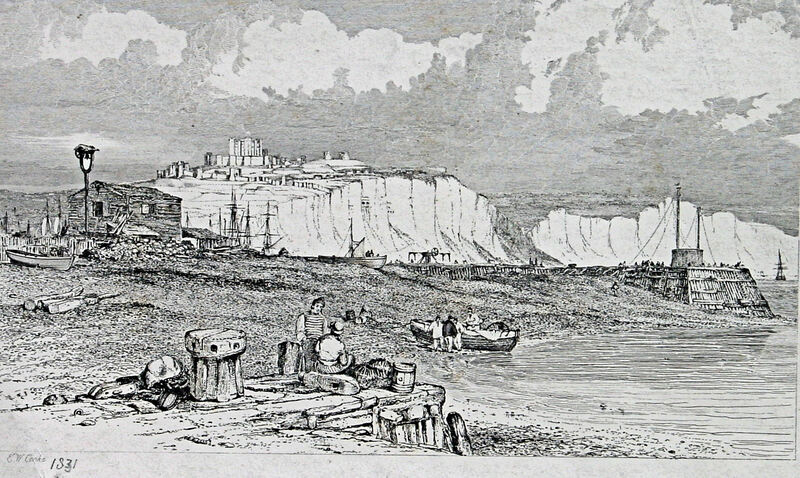 At that time, Dover’s main harbour was on the western side of the Bay and the outer entrance, through the south and north pier heads can still be seen today. The harbour master James Moon who was also an engineer, had been working on the perennial problem of Dover harbour entrance being blocked with shingle. This was caused by the Eastward Drift that carried the shingle round the west point of Dover’s bay and deposited it on the seashore and in the harbour entrance. To try to combat this Moon had undertaken a number of major building works, one of which was the reconstruction of the Crosswall alongside the Tidal Harbour. This took place between 1819 and 1821. 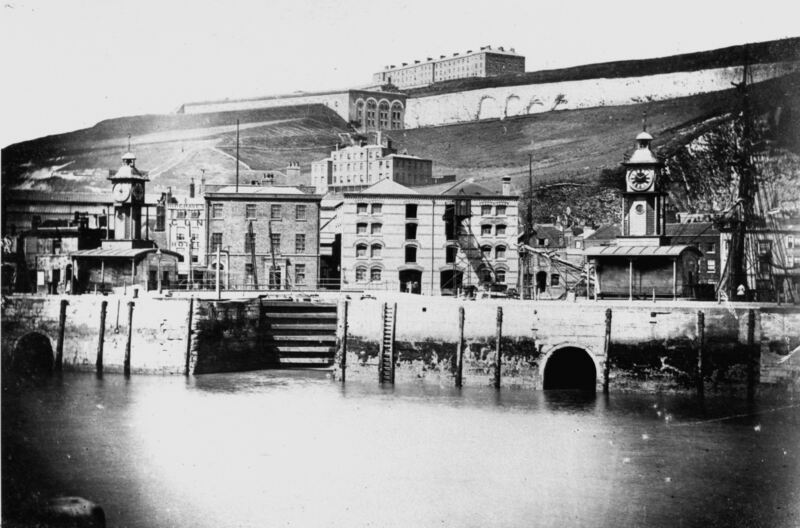 New gates were erected opposite to the outer entrance to the harbour and giant sluices were inserted. The idea was that the Bason, as the inner harbour was then called, would fill up with seawater at high tide and this would be released through the sluices at low tide. The force would be such that it would clear the outer entrance of shingle. The sluices’ operating mechanism was by the east lock gate, although efficient, it was large and ugly. Moon suggested that a clock tower should be built to house this and at the same time the edifice would add a sense of magnificence to the entrance of the Bason. The idea of an impressive clock tower was well received and four clocks were made by I P Paine of London. The faces were painted red in the centre with a white outer rim and black numbers. The Tower was officially opened on 14 April 1830 and looked magnificent, won a national award, but looked decidedly odd. This was due to the lack of a similar edifice on the opposite side of the gates. Funds were made available to build another, similar tower containing four compass faces, on the western side and was completed and erected the following year. The entrance to the inner harbour looked exactly as Moon had envisaged and both the council and the Harbour Commissioners were pleased. However, the clock tower did not go down well with every visitor to the town. Charles Dickens (1812-1870), stayed at the Ship Hotel on the then Custom House Quay opposite the clock tower in 1856. He was in Dover to work on Little Dorritt but due to concerns over domestic issues, he spent a lot of his time taking long walks and talking to locals. As the century, progressed ships became larger and parliamentary approval was gained to undertake a number of works including widening the entrance to the Bason. After much consideration, it was decided to demolish both the clock and the compass towers. This took place in May 1871 and the clocks went sent to John Bacon of 4 King Street. A clock maker, John removed the red paint, cleaned and restored the clocks and kept them until a decision was made as to what to do with them. The entrance to the Bason was widened to 70-feet and the sill was lowered allowing vessels drawing 20-feet at spring tides and 16-feet at neat tides also to enter. Earl Granville – the Lord Warden (1866-1891) – opened the newly modified Bason on 6 July 1874 and it was renamed Granville Dock. At the west end of the Esplanade on the Sea Front, next to the lifeboat house that was built in 1866, a new Clock Tower was built and in 1877 the refurbished clocks were installed. The aggregate expenditure was £74,416 13s 1d. The Prince of Wales Pier was built as the east pier of a new Commercial harbour and completed in 1902. To make room for the root of the new Pier, the Clock Tower was moved and the lifeboat house was demolished and rebuilt on the west side of the clock tower. Before then the Admiralty had commissioned the harbour we see today that was officially opened in 1909. In 1905, the King’s harbourmaster of the Admiralty Harbour was Captain Chambré RN and he took over Clock Tower making it his headquarters. During his time semaphore equipment was installed on the roof and other modifications took place. Throughout both World War I (1914-1918) and World War II (1939-1945) the Clock Tower came under the jurisdiction of the military and no doubt during the latter War came under heavy shelling although details are not available. However, on Monday 21 October 1940, during heavy shelling, it was reported that there were two casualties at the Clock Tower. On 18 January 1943, an oil bomb was dropped near the Clock Tower and it was reported that it lit up the whole of that side of the harbour. Much of the surrounding area was devastated during the War and was subsequently demolished. Following World War II pillboxes, barbed wire and other anti-invasion precautions along the Sea Front were removed. 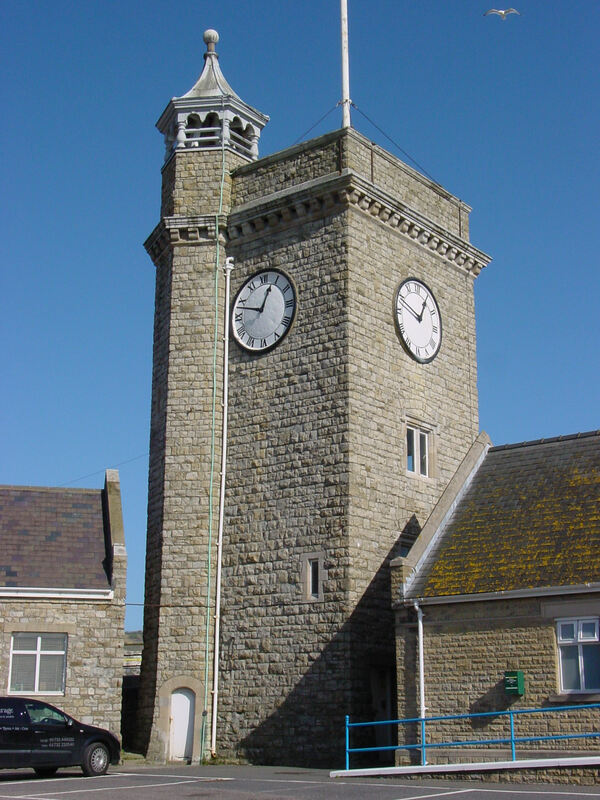 The Clock Tower was restored and returned to civilian use together with the lifeboat house next door. For many years, when a vessel was reported to be in distress, Port Control would ‘electronically’ fire two maroons from the roof of the Clock Tower to call out the lifeboat crew. In order to prevent the maroons being fired at the same time as person was up there a safety switch had to be operated to give access. The maroons were kept at the lifeboat house at the Eastern Docks and were replaced by members of the crew when they returned after being called out. The maroons ceased to be fired with the advent of technological paging systems. In 1997, it was planned to turn the Clock Tower into a restaurant but this came to nothing. 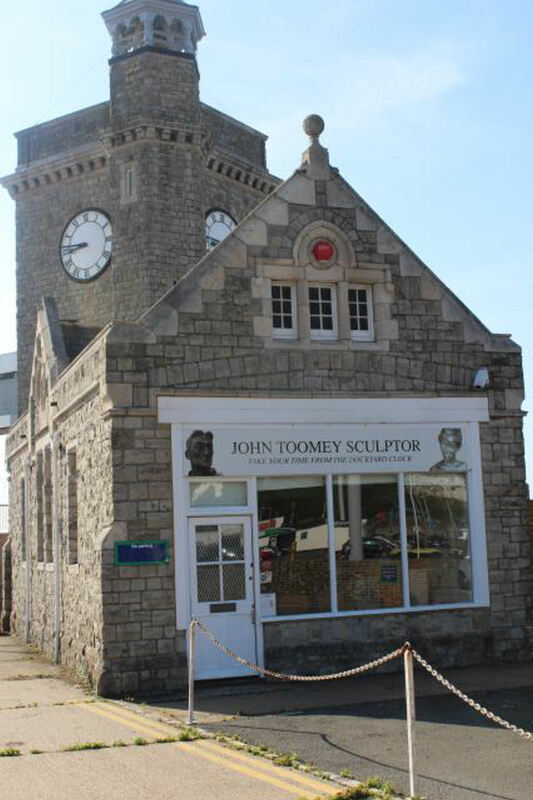 More recently, the building was Listed and although there are new redevelopment proposals for the western part of the harbour I have been assured by a spokesperson, on behalf of Dover Harbour Board, that the Clock Tower is safe. This entry was posted in Buildings, Clock Tower, Clock Tower, Maritime. Bookmark the permalink.